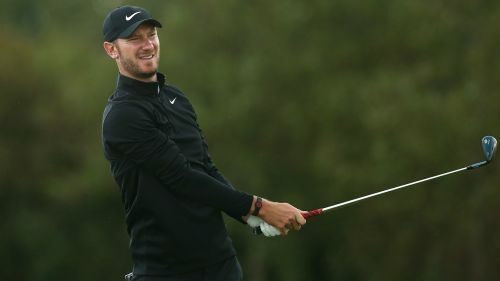 Chris Wood produced an impressive third-round 65 to seize the lead at a competitive KLM Open as Wu Ashun, leader after each of the first two rounds, faltered. The Englishman now sits at 13 under at The Dutch, leading a chasing pack containing Wu, Hideto Tanihara and compatriot Jonathan Thomson by one shot. Wood was one over through five on moving day, but responded in style by reeling off seven birdies over the next 13 holes to finish six under for the round and seize a narrow advantage. "I'm pleasantly surprised," said Wood, a three-time winner on the European Tour who has a pair of second-place finishes to his name this season. "My target was 15 under for the tournament so I'm going to look a little bit differently at that now. I'll take another 65 tomorrow if you offer it me now." China's Wu had been on fire on Thursday and Friday with scores of 64 and 66 – his best 36-hole effort on the European Tour - but he struggled to a level-par round of 71 in Spijk on a day where his rivals had no problems with scoring, meaning his three-shot lead evaporated. Back-to-back bogies at 11 and 12 had Wu under severe pressure at two over for the day, but birdies on 14 and 18 ensured he limited some of the damage to remain in with a fighting chance. Japan's Tanihara is right in the mix after charging from eight shots off the pace at the start of the day to within one of Wood with a magnificent, birdie-free 63 that matched the course record. Also in contention going into Sunday is fifth-placed Richard McEvoy at 11 under, while David Drysdale and Padraig Harrington are three shots off the lead. Thomas Detry tied Tanihara for the best round of the day - his 63 containing nine birdies - and he sits at nine under par along with Andy Sullivan as a result. Li Haotong and Jordan Smith are a further shot back.